Max-Out Radio Podcast #? With Guest, Derek 'Beast' Charlebois. Mike & Cassandra discuss training myths for women, supplements specifically for women, and more. In the news, Mike discusses studies that look at improving weight training compliance in female athletes and exercising when pregnant. Listen in! Welcome to Episode #4 of the Max-Out Radio podcast series! This week, your esteemed host, Mike Roussell, discusses bulking and lean muscle gain, and more - with special guest, Derek "Beast" Charlebois! Click Play To Start The Show. Click the play button to listen to the latest informational episode of Mike Roussell&apos;s new podcast! In most browsers, you can just click on the play button above (in the Audio Player) and it will start playing. Right-click on the "Download" link. Choose the destination of your download. Derek "Beast" Charlebois is an ACE-certified personal trainer, competitive bodybuilder, and holds a Bachelor&apos;s degree in Exercise Science from The University of Michigan. Derek is the Promotions Coordinator/R&D at SciVation/PrimaForce and is involved in coordinating promotions, research and development, advertising, and marketing. 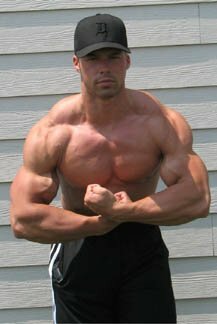 Derek is an accomplished author with articles on such websites as Bodybuilding.com, Bulknutrition.com, the online magazine StrengthAndScience.com, and contributed to the book "Game Over: The Final Showtime Cut Diet You&apos;ll Ever Need!" Derek is available for online personal training. His website is BeastPersonalTraining.com or via email, at: derek@scivation.com. Articles By Derek "Beast" Charlebois. I started lifting after I watched "Rocky 4." That movie really motivated me. I saw Rocky working out and striving to overcome obstacles, and I knew that&apos;s what I wanted to be like! Arrange onion, potatoes, carrots, turnip, and rutabaga in bottom of slow cooker. Season chicken all over with salt and black pepper. Place chicken on top of vegetables in slow cooker. Whisk together tomato sauce, honey, chili powder, cumin, mustard powder, and garlic powder. Pour mixture over chicken. Cover and cook on low heat for 12 hours or on high heat for 8 hours. Makes 3 servings. *Denotes change in recipe. **Flour was also removed from original recipe.